The Language Legacies grant program supports documentation and revitalization efforts throughout the world. It is open to community members and researchers from any country. An academic degree is not required, but the application must provide evidence that the applicant can achieve the stated goals. Grants are for one year and average around $2,500 (US). Please see our Request for Proposals for more details. Click a year to view Language Legacies Grant recipients for that year. 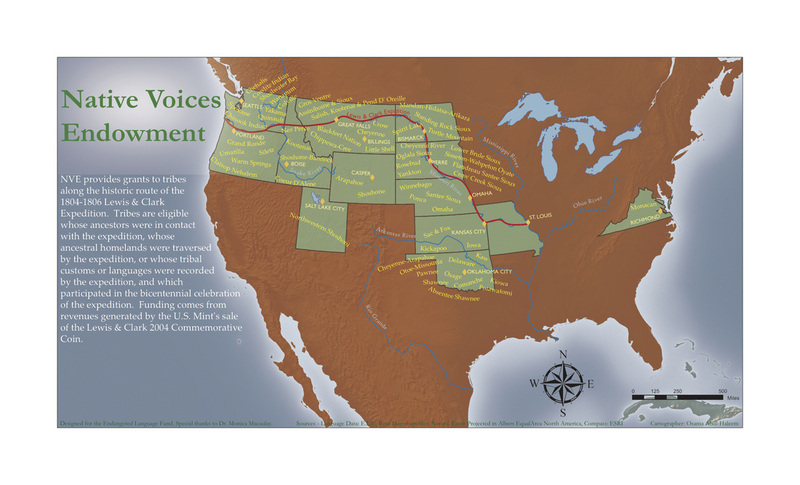 ELF provides grants for eligible tribes and languages through the Native Voices Endowment: A Lewis & Clark Expedition Bicentennial Legacy. ​These funds come from the Lewis and Clark Bicentennial Council, which received the revenues from the U.S. Mint's sale of the Lewis and Clark 2004 Commemorative Coin. Grants through this program are available to members of the Native American tribes that came in contact with the Lewis and Clark Expedition between 1803-1806. Grants are available for work on documentation and revitalization of the languages of these tribes (see below for list of eligible tribes and languages). Applicants (Principal Investigators) must be enrolled tribal members or employees of tribal colleges. Scholarships for academic work in linguistics or a Native language, or for Master/Apprentice programs are also available for tribal members. To learn more about the Lewis and Clark Bicentennial, please visit lewisandclark200.org. Applying for a Native Voices Endowment Grant:The application deadline has passed. Please check back later for further information. Click here for a list of eligible tribes. ​Click here for a list of eligible languages. Click here for the Request for Proposals.